When you’ve visited the wonderful museum (don’t forget to wear shoes! ), seen the temples and bought your onward ticket, what more can you do with a few hours to spare in Lanzhou on a sunny afternoon in summer? Two options are quite tempting. 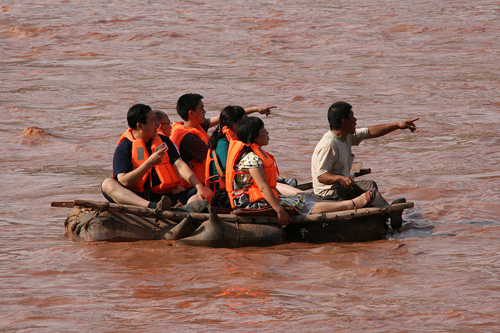 One is to float down the Yellow River on a raft made of inflated goat skins. 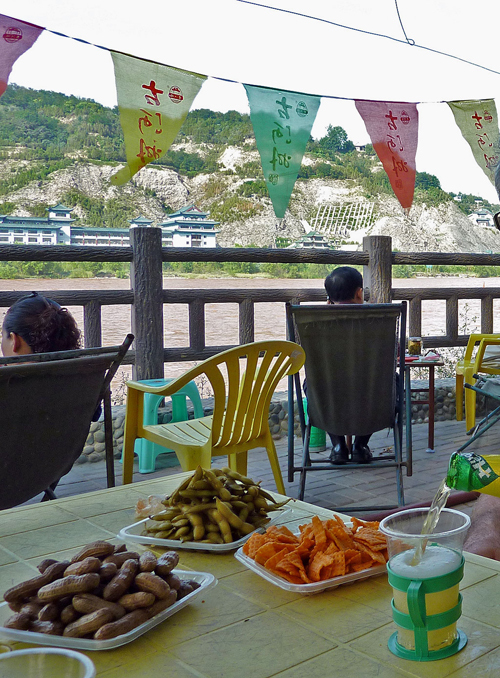 The other is to sit on a tree-shaded reclining chair by the banks of the Yellow River sipping Huanghe Beer (Yellow River Beer), snacking on spicy munches and watching other people float down the river. We chose the latter. Lanzhou maybe one of the world’s most polluted cities, but in summer when it rains the air seems to be at least breathable. The river bank has been nicely spruced up since we first saw it in 1990 and is now a pleasant recreational area. The part by the enormous water wheels is especially nice. You pay 5 Yuan (50 cents Euro) to enter and this entitles you to comfy chairs with great views over the river and the attractive White Pagoda Hill on the other side. 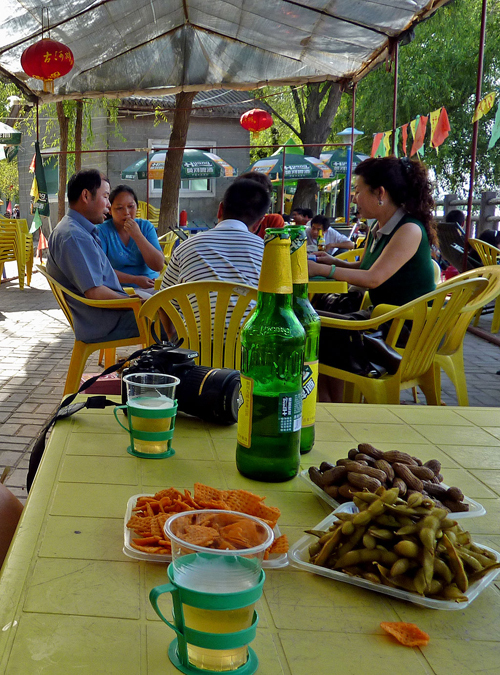 Beers cost 4 Yuan and snacks 5 Yuan. Ah Bliss! There are moments in China when it can be convenient not to speak or understand Chinese and instead pretend that you are a dumb tourist. 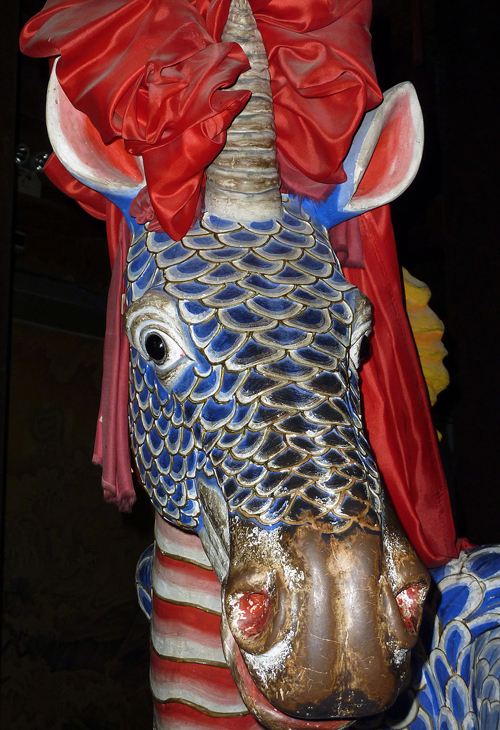 Our visit to the wonderful Gansu Provincial Museum was one of those moments. It took nearly 40 minutes crawling through Lanzhou’s choking traffic in a taxi to get to the Museum; we picked up our free tickets and approached the entrance. A young guard came up to us before we could get to the security check and asked in Chinese if we could “jiang hanyu” (speak Chinese), being polite I replied “huì” (we can). He then pointed at our feet and said “bu keyi chuan tuoxie” (you can’t wear flip flops). I looked at him in disbelief and protested, but to no avail. 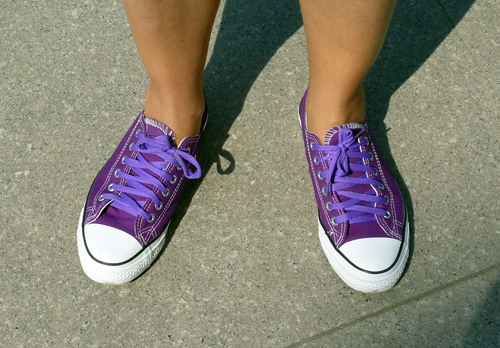 Margie enquired about her Crocs and “ye bu keyi” (also not) was his answer. We continued to argue, but met with the same reply; apparently the “guiding” (the rules) stipulated that plastic footwear wasn’t allowed…! 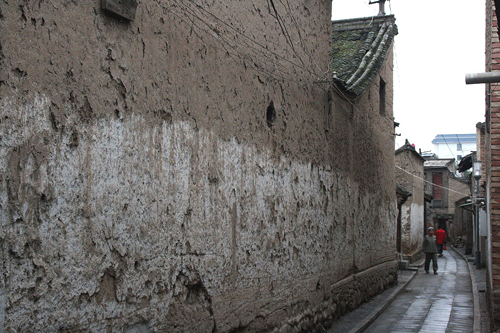 In 2002 we made a route that we called the Lanzhou 兰州 – Pingliang平凉 – Tianshui天水 Triangle (Click here). 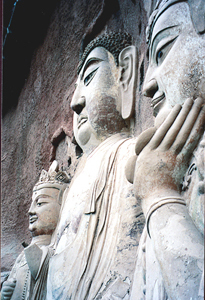 This August (2009), we returned to Tianshui and Lanzhou to add a few more interesting sites to the route. 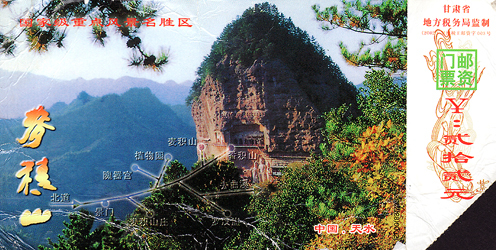 Namely, the Water Curtain Caves 水帘洞 and Lashao Si 拉稍寺 near Luomen 洛门 and Daxiang Shan大像山 near Gangu甘谷. 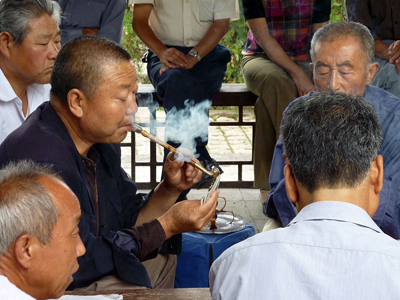 We also took the opportunity to revisit Maiji Shan 麦积山 and explore the historic part of Tianshui; Qincheng. With good restaurants, reasonably cheap accommodation, a few sites and some remaining old traditional architecture, Tianshui makes a decent base for a number of excursions. I lay on the bed unable to sleep but hoping beyond hope that the train would arrive late. However, my hopes were dashed when the conductor shook my shoulder and warned that “We are arriving in 5 minutes”. The train pulled into to Tianshui Station at 3.57am exactly on time and we alighted bleary eyed. Sunday 11 November 1990: hard seat from Jiayuguan to Lanzhou! After an hour-and-a-half wait at the station we embark on our very own journey through Dante’s inferno. As we only have standing tickets, we literally have to fight our way onto the train and through five carriages already overflowing with people, before finding any place at all. We end up in one of the little hallways, right by the place where the train bends, and not even in any protected corner, but smack in the middle. The first six hours are a bit of a nightmare: there is nowhere to put our backpacks, we eventually have to lay them flat on the floor and kind of squat on top of them. Unfortunately, people are endlessly pushing trolleys with food and drinks through the aisle and each time we have to lift all our luggage and make ourselves as small as possible. The hot-water trolley, which passes every two hours, is the worst as it leaks water and oil, covering the floor in a disgusting black sludge, in which we have no remedy but to put our packs down again. To make matters worse, in its wake, the hot-water trolley is inevitably followed by a horde of pushing and shoving Chinese, anxious to refill their thermos, or jam-jars, full of tea. It’s this continuous, heaving mass of people, fighting to get past you, while you struggle to keep your balance and defend your patch, that really tires you out and wears you down. 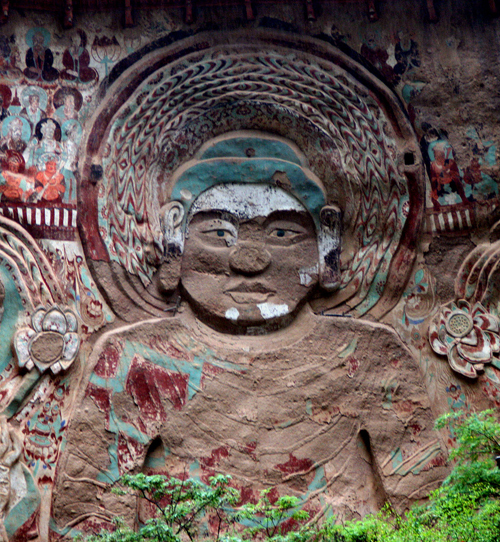 The main reason for going to Tianshui is to visit the fantastic grottoes known as Maiji Shan Shiku, or Haystack Mountain. 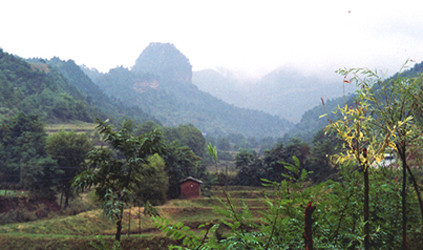 Maiji Shan is a flat-topped rock formation, set in the midst of dense green forests. 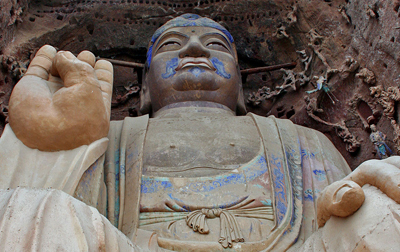 There are two groups of three large statues each, the highlight of which is a 16-metre Buddha, carved on the rock face. Then there is a whole series of caves, connected by amazing walkways that provide good views of the statues, as well as the opportunity to look into every nook and cranny of Haystack Mountain. 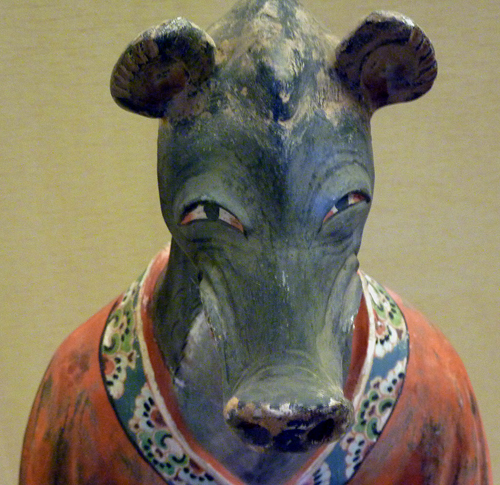 With statues ranging from the Northern Wei, through to the Qing dynasty, there is a real sense of…….. It wasn’t as easy as we had thought. Having paid 200 yuan for the Gansu Travel Insurance, a worthless piece of paper that does nothing for the hapless traveller, but protects the bus company in case you are injured or killed on one of their buses, a possibility that cannot be excluded, given some of the driving and conditions on the roads, we expected to be sold a ticket and board the bus to Pingliang. Adam had seen on the departures board that a bus was leaving at 11.20, so he strolled over to the window, insurance paper in hand, to purchase two tickets. To our amazement, he was told by the rude attendant that there were meiyou (no) buses to Pingliang, ever, and that we had to take the train. Disbelieving, we went outside, to the departures area where we identified the actual bus and checked with the driver and conductor, who both confirmed that this was indeed the bus to Pingliang and that it was leaving at 11.20, but that we had to buy a ticket at the ticket office. Round two: we returned to the office, choosing a different window, and asked for 2 tickets again. The second attendant just waved her hand at us in a dismissive manner and said meiyou baoxian (no insurance). So that was the problem? Triumphantly, Adam pulled out the insurance paper and placed it in front of her. Without even looking at it she just repeated meiyou and turned to the customers behind us. Though Adam insisted that our insurance was in order, she just blanked us, as if we didn’t exist. And here began one of those episodes that occasionally can drive China travellers to despair: we refused to budge, she refused to look at us, or our insurance. After a stand-off of 2 or 3 minutes, she pulled down the shutter and moved away. We tried two more ticket sellers, but met with the same response. Eventually, we decided to just board the bus. We took two seats and waited. The conductor wanted to take us and was willing to purchase two tickets on our behalf. Unfortunately, an inspector prevented her from doing so. By now it was 11.20 and the driver was anxious to leave. However, knowing that we were in the right, we refused to get off. It was an uncomfortable situation for all, but we held our ground, locked in a ridiculous battle of wills. As a last resort, Adam decided to appeal to the PSB, the security police. Leaving me on the bus, he went to the PSB desk inside the bus station. 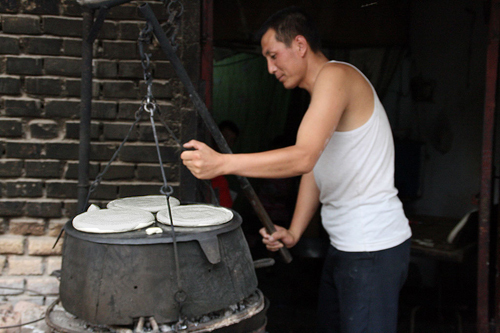 A friendly officer told him that he needed insurance to travel in Gansu province. Patiently, he again produced our insurance papers. Again, without looking at the papers, the officer told Adam to follow him to a travel agent’s next to the bus station. 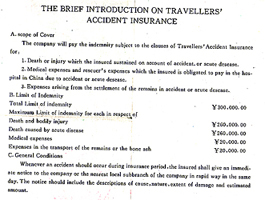 The agent pulled out some forms for us to fill in and said the insurance would cost 200 Yuan. Totally exasperated Adam showed our papers again and, at long last, someone actually bothered to look at them! 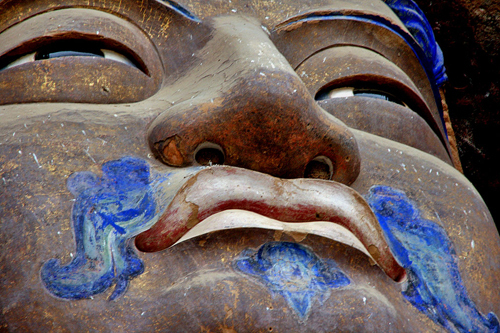 ‘But you already have travel insurance!’ the surprised travel agent exclaimed, comparing the two forms. Back to the station Adam went, victoriously, accompanied by the PSB officer. He marched up to the same ticket seller, who had previously spurned his insurance papers. This time she merely smiled sheepishly and quickly sold him two tickets. Then we were off!